The NJPW/CMLL Fantastica Mania 2019 tour continued today in Tokyo's Korakuen Hall. 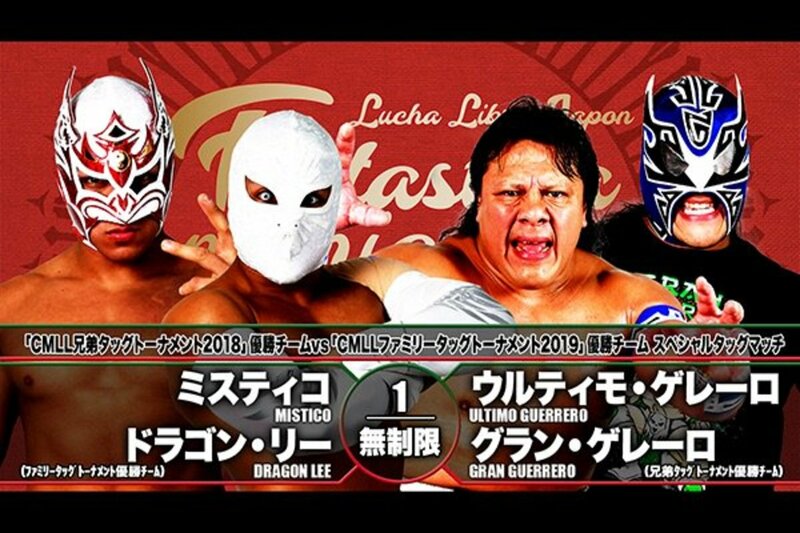 The main event saw the CMLL Family Tag Team Tournament winners Dragon Lee & Mistico face off against the CMLL Brothers Tag Team Tournament victors, Ultimo Guerrero and Gran Guerrero. The only singles match on the show saw NJPW veteran Satoshi Kojima taking on CMLL's Terrible. A solid opener featuring a mix of decent work and the usual Taguchi comedy. Flyer and Gedo started out. Ishimori jumped in for an illegal double team, but Flyer sent him to the floor. Flyer hit a tope con hilo. Taguchi went for a pescado, but Ishimori and Gedo moved -- and he took out Flyer by mistake. Gedo and Ishimori worked over Taguchi. Taguchi missed with two hip attacks on Gedo, but then hit a third. Taguchi hit a springboard hip attack on both Gedo and Ishimori, then hit a series of hip attacks on both. Taguchi hit a Kokeshi for a near fall on Gedo. Taguchi used an ankle lock on Gedo, but Ishimori broke it up and applied an ankle lock of his own. Flyer hit a frankensteiner. Taguchi hit a pescado. Flyer hit a springboard crossbody, and then used a powerslam. Ishimori made his own comeback, then used an ankle lock on Flyer for the submission. Ishimori used an ankle lock on Taguchi after the match. These guys had a great match, well worth going out of your way to see. Titan and Templario kicked things off with a really nice sequence, exchanging holds, takedowns, and covers. Angel and Cuatrero followed with an equally great sequence, ending with Angel sending Cuatrero to the floor with a headscissors. Angel teased a dive, but ended with a handspring into a pose in the ring. Really cool stuff. Titan almost did a Sasuke Special, but Templario moved and powerbombed him on the floor. Cuatrero and Templario doubled up on Titan for a bit, but Titan made a comeback and sent them to the floor. Angel hit a golden triangle, and Titan hit a tope con hilo. Back inside, Angel hit a quebrada for a near fall, then hit a great dropkick. Titan and Templario had a chop battle. Templario hit a sit-out powerbomb for a near fall. Templario hit a German for a two count. Templario went for a gutwrench powerbomb off the middle rope, but Titan turned it into a rana, then hit a moonsault to the floor. Cuatrero got a near fall off a powerbomb. Angel applied La Mecedora and got the submission win. Everyone was working at half speed here. The match didn't have a lot of heat, and it was sloppy in places. Shingo out-powered Fujin early, so Raijin jumped in and exchanged lariats with him. Shingo and SHO is a future Intercontinental title match for sure, right? Shingo used a brainbuster and a front facelock on Raijin. BUSHI jumped in and went for Raijin's mask. Naito attacked Henare and Fujin on the floor and sent them into the crowd. Back inside, Naito and BUSHI hit stereo low dropkicks to Raijin. Shingo hit some elbow drops, then hit a senton for a near fall. Shingo blocked a spear, but Raijin hit a German. Naito and Henare got tags and traded strikes. Henare hit a tackle and a Samoan drop for a near fall. Naito came back with an enzuigiri, and he used a draping neckbreaker. Henare hit a spear on Naito, then hit a suplex on BUSHI. Fujin got a tag and hit a back elbow on BUSHI. Fujin and Raijin hit stereo dropkicks on Shingo, then stereo knees on BUSHI. Shingo broke up a 3K attempt, and BUSHI hit a backstabber. BUSHI hit the insurrection on Fujin for the pin. BUSHI and Shingo unmasked SHO and YOH after the match. Not much here. Atlantis Jr. has potential, but he's still incredibly green. Liger always looks great, but Atlantis is fairly immobile. OKUMURA attacked Atlantis Jr. before the bell. Atlantis started off, and Sanson and Forastero ran into him so he could do his offense. They ran into some hip tosses and arm drags. Liger jumped in. OKUMURA's second, his wife Mima Shimoda, jumped in, and Liger suplexed her. Sanson and Forastero worked over Atlantis. Liger broke up a pinfall. Forastero and Sanson crotched Atlantis on the post. Liger hit a crossbody off the post to the floor. Atlantis Jr. and OKUMURA exchanged near falls -- until OKUMURA hit a DDT for the pin. OKUMURA and Sanson removed Atlantis and Atlantis Jr.'s masks after the match. This wasn't so much a match as a series of crazy dives. It was awesome in that regard. They started off hot, with everyone hitting their flashiest offense. Caristico, Cavernario and Namajague got sent outside, and Volador, Soberano, and Audaz hit stereo tope con hilos to the floor. Back inside, Caristico and Cavernario worked over Volador. Soberano jumped in, but fell victim to a Swanton Bomb from Caristico. Audaz entered, but he also found himself worked over three-on-one. Audaz broke up a human pyramid spot with a flying rana. Everyone hit big dives to the floor. They did a tower of doom spot. Volador hit a top rope splash. Soberano hit a high cross off the top. Cavernario hit a Canadian Destroyer. Volador hit a Canadian Destroyer. Volador unmasked Caristico, and there was a scramble to get his mask back on. All six men were in the ring. They did a row boat spot. Volador hit a rana into the middle of the row boat for a near fall. Audaz and Soberano hit dives to the floor. Caristico used La Mistica on Volador for the submission. I have no idea how to review this match. Kojima can still go. Terrible can do some stuff well and has a great look, but he's not a great worker or anything. The crowd was very forgiving. They worked a slower pace. They locked up. Terrible broke cleanly against the ropes, but then kicked Kojima low. They traded chops, and Terrible won the exchange. Kojima took a bump off a chop. Kojima hit a shoulder tackle and flexed his pecs. Terrible hit a dropkick, and Kojima rolled to the floor. They fought on the outside. Terrible posted Kojima. Terrible used an eye rake and bit Kojima. Back inside, Terrible hit a knee drop, then posed on the turnbuckle. Terrible hit a series of strikes to the chest. Kojima countered with machine gun chops. They fought on the top rope, and Kojima hit a superplex for a two count. Kojima hit a top rope elbow for a near fall. Kojima hit a rolling elbow and clotheslined Terrible to the floor. Kojima hit a plancha. Terrible recovered and posted Kojima's lariat arm. Kojima countered a suplex attempt with a DDT and a cutter. Terrible blocked a brainbuster and hit a vertical suplex for a two count. Terrible hit a top rope splash for another two count. Kojima backdropped out of a suplex attempt, and hit a brainbuster for two. Terrible ducked a lariat, then hit a series of strikes. Terrible hit a Styles Clash for the pin. LIJ came out to pose with Terrible after his win. A really fun match. After a lot of stalling early, the pace really picked up and they worked hard for the last 15 minutes. Ultimo whipped Mistico with a piece of his gear before the bell, so Ultimo and Mistico started off the match. Ultimo stalled and worked the crowd. The two shook hands before locking up. Ultimo removed his mask. Mistico removed his mask, revealing another mask underneath. Ultimo used a Romero Special. Mistico rolled through into an inverted figure four. Ultimo rolled to the ropes, but he sold his knee big. They rolled outside. Mistico hit a flying rana on the floor. Back inside, Dragon and Gran jumped in. Ultimo pulled Dragon to the floor and sent him into the barricade. The Guerreros took control, doubling up on Mistico. They hit a tandem press slam off the top, sending Mistico to the mat. Dragon jumped in and ate a brainbuster from Gran. The Guerreros raised the roof. Dragon hit a dropkick on Ultimo, then a suplex on Gran. Mistico ran wild with ranas. Dragon and Mistico hit topes. Mistico and Dragon used tandem offense on both Guerreros. Mistico hit a standing moonsault for a near fall. The Guerreros hit stereo baseball slides. Gran hit a tope, and Ultimo hit a diving leg lariat off the post to the floor. Gran and Dragon ended up the legal men. Dragon hit a Spanish fly for a near fall. Mistico hit a frankensteiner on Ultimo. Dragon hit a jumping knee to Ultimo, then used a crossface, but Ultimo reached the ropes. Dragon went for a top rope rana, but Ultimo turned it into a powerbomb off the second. Dragon and Ultimo fought on the top rope. Dragon hit a double stomp, but Gran broke up the pin. Dragon hit a suicide dive. Gran hit a powerbomb on Mistico for a two count. Mistico hit a top rope frankensteiner on Gran for a near fall. Mistico used La Mistica for the submission win.